The feast of the Transfiguration of the Lord on Thursday August 6, 2015, will be marked by a Solemn High Mass in the Extraordinary Form of the Roman Rite at Holy Comforter-Saint Cyprian in Washington, D.C. The Mass, at 7.30pm, will be celebrated by Father James Bradley, who will also preach. He will be assisted by Father Paul Scalia (Arlington) and Father Daniel Richards (Harrisburg). 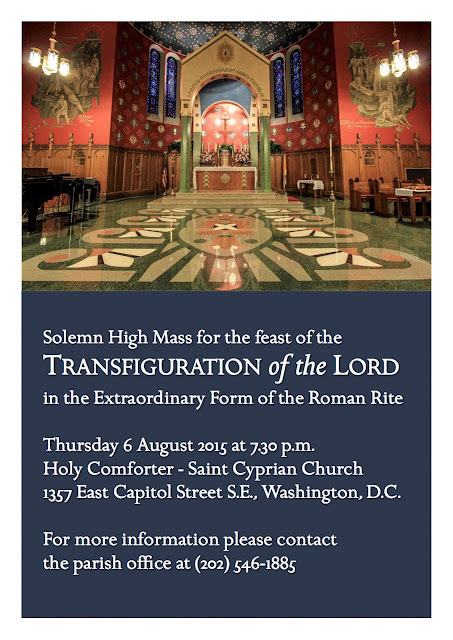 The Mass will be sung to the plainchant Propers and Ordinary. Further details are available here.